Take in a show at the historic Wilma Theater. It is often said that Missoula has more culture than any other city in Montana. Missoula, therefore, is the place to go in Montana to hear live music, watch a show, and see art. Many people spend a few days at our Missoula Bed and Breakfast in order to do just that. They come here from more rural areas to see a show and browse art galleries. They come to feel the pulse of the city and the energy of the university. It’s invigorating. It’s fun. Art galleries abound in downtown Missoula. One of the best times to visit them is on the First Friday of each month, when they stay open late and host artist receptions and other special events. The University of Montana in Missoula brings a host of fantastic performers to the stage year-round. Some, like the Buddy DeFranco Jazz Festival, are much anticipated. Others, such as the Symphonic Wind Ensemble, draw more intimate crowds. There there is The Adams Center, which has the largest indoor seating capacity in western Montana; it brings such names as Dierks Bentley and the Rolling Stones. 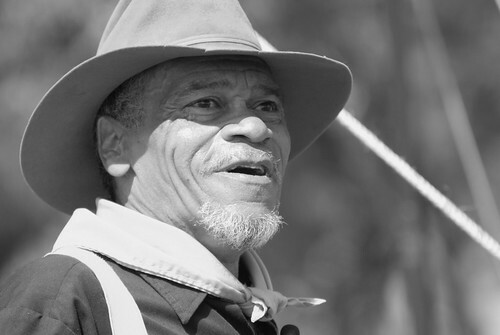 Learn about the Buffalo Soldiers at Fort Missoula. There is also a good deal of history in and around Missoula. The Historical Museum at Fort Missoula reveals the rich history of Missoula County. The Holt Heritage Museum is a great place to learn about cowboys and their rodeos and Indians and their Pow Wows. The Montana Museum of Art and Culture has a superb collection of Rocky Mountain west art, contemporary Native American art, and a respectable number of pieces from Southeast Asian and European masters. Treat yourself to a few days of culture. Allow yourself to be pampered while staying in our Missoula Bed and Breakfast. You’re worth it. 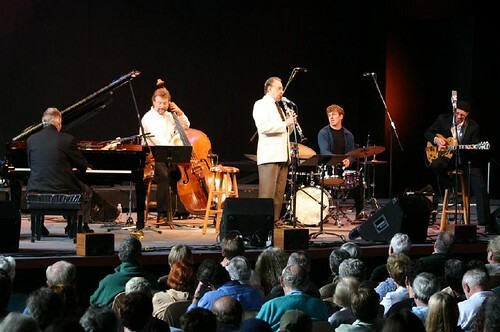 April means jazz in Missoula, thanks to the annual Buddy DeFranco Jazz Festival. In 2012, the festival takes place April 27 and 28. As of this writing, we still have some space available at our Missoula Bed and Breakfast during the festival. Buddy DeFranco plays jazz and bebop clarinet like nobody else. He has worked with such greats as Count Basie and the Glenn Miller Orchestra. He has performed with Art Tatum, and Gene Krupa. He is still going strong at 89. The Buddy DeFranco Jazz Festival at the University of Montana is a noncompetitive, educational event for high school and college jazz bands. The public is invited to attend as well, and those who do are rewarded with some fine music. In addition to high school and college jazz bands, each year the festival features some of the biggest names in jazz. This year, performers include Bob Sheppard, Ignacio Berroa, David Morgenroth, Clipper Anderson, and the UM Jazz Band. Buddy DeFranco himself will take the stage on Saturday night. Each year we welcome jazz fans to our Missoula Bed and Breakfast during the festival, as well as families of some of the younger performers. It’s always an exciting weekend, and we’re looking forward to it. Additional festival information is available at UMT. The Montana Snowbowl is 100% open, with almost three feet of snow at its base and seven feet of snow at the summit. More than a foot of snow has fallen this week, and more snow is in the forecast for tomorrow. That’s good news for skiers. The Missoula Montana Snowbowl. So close. So wild. If you’re a skier, head to our Missoula Montana Inn today. Take advantage of the long Presidents Day Weekend, and maybe treat yourself to a few days off next week as well. Ski until you drop with fatigue, rest up at Blue Mountain B&B, then hit the slopes again. Our sumptuous breakfasts will provide lots of fuel, so you can ski longer, better, faster. Really. At night, when you’re too tired to do much of anything, chose a movie from our DVD library and stretch out with a bowl of warm popcorn. Does life get better? If you love that four-letter word, snow, as much as we do, head to Missoula and the Montana Snowbowl today. We love Lolo Pass winter, spring, summer and fall, but there is something extra special about Lolo in the winter. Perhaps it’s the high elevation, which means there is usually snow at Lolo even when it isn’t elsewhere. Perhaps it’s the miles of cross country and snowmobile trails. Then again, it could be the fact that after spending a day out in the snow, we can warm ourselves in the Lolo Hot Springs. 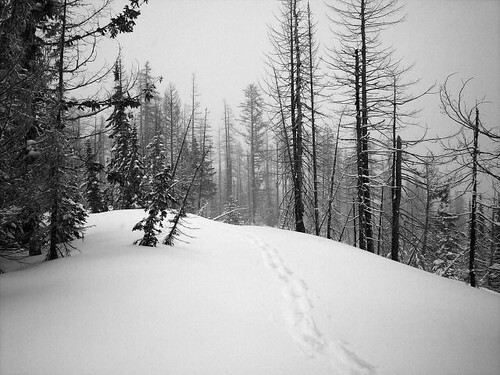 Spend a day snowshoeing at Lolo Pass, then sink into a deliciously warm Mineral Hot Spring. Sitting in a pool of hot water on a cold day, with snow piled all around, is wonderful. It evokes deep sighs of contentment. It’s one of those experiences, like floating in a warm ocean or standing atop a tall mountain on a clear day, that reminds us just how beautiful life can be. Our Missoula Bed and Breakfast is about 30 minutes from Lolo Hot Springs. 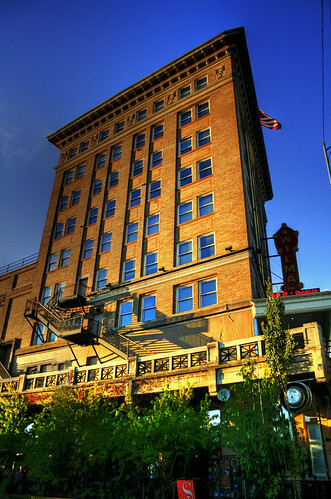 During a weekend stay, guests may enjoy nights on the town in Missoula, gourmet breakfasts at the inn, days in the snow at Lolo Pass, and soaks in the Lolo Hot Springs. Which is the pinnacle experience? We’ll let you decide. Lolo Hot Springs are open Friday through Sunday from 10 a.m to midnight, and Monday through Thursday from 10 a.m. to 10 p.m. Indulge in a soak during your stay in our Montana Bed and Breakfast, even if you’re in Missoula for business. It’s worth it. 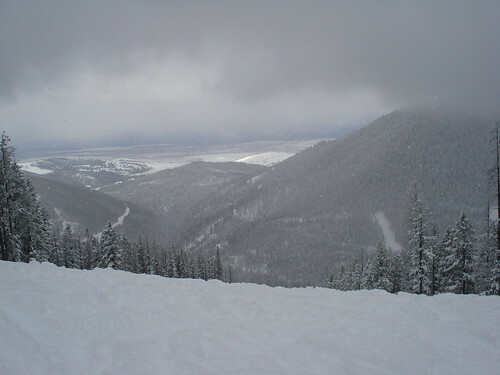 The view from the top of the Montana Snowbowl. There is snow in the mountains and there are skis on our feet. Not everyone who lives in Montana is a fan of winter sports, but most of us are. We would be hard pressed to deal with so much snow if we didn’t love it. When snow covers the mountains, we feel our feet start to twitch. Out with the hats, gloves, and down jackets. On with the skis, snowboards, and snowshoes. Many of the folks who stay at our Montana Bed and Breakfast during the winter come here for the snow sports. Some stay for a weekend, and some for a week. Some come back over and over again, while others head off to different parts of the state, to different mountains and different snow. The Montana Snowbowl is close to our Missoula Bed and Breakfast; it takes about 45 minutes to drive to the mountain from here. We provide a good start to your day on the slopes: a hearty, healthy breakfast. After consuming it, you’ll be ready to ski or snowboard until the mountain closes at 4 p.m.
As of this writing, about 60% of the Montana Snowbowl trails are open, and the mountain is open every day. 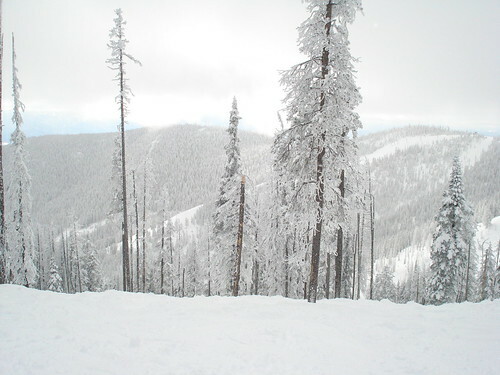 Current conditions are available at the Montana Snowbowl. Look ahead to the calm after the holidays–to the moment when you’ll have time to run away to the slopes for a few days. Make your plans now. Be sure to bring your dancing shoes to Missoula's First Night celebrations. Missoula knows how to throw a party, and the biggest party of the year is the one that takes place to ring in the new year. Don’t miss it. If you live some distance from town, we hope you’ll give us a call and make your New Year’s Eve reservation at our Missoula Bed and Breakfast. We say it’s the biggest party of the year, but really, it’s more than that. Events begin as early as 10 a.m. and continue until 2012 has made itself at home. They are hosted all over the city, from senior centers to museums to the Southgate Mall and beyond. There are numerous events for all ages, and many that are fun for the whole family: toddlers, teenagers, and grandparents. Live music will be performed at venues such as the UC Lounge, the UM recital Hall, and the Missoula Senior Center. There will be ice skating from 1 to 8 p.m. at the Glacier Ice Rink, and Ice Carving in front of the Courthouse from 9 a.m. to 5 p.m. There will be Taekwando and Fencing at the Southgate Mall, Poetry readings at the UC 3rd Floor Conference Room, and fun events at the Children’s Museum all day long. First Night is a fantastic way to bid farewell to 2011 and welcome 2012. It’s meant to be fun, and it always is. Ask about spending New Year’s Eve at our Missoula Bed and Breakfast. 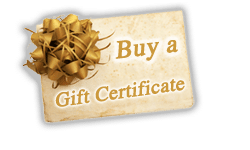 Call 877.251.4457. Additional event information may be found at First Night Missoula. My Home is Where My Tipi Sits is an upcoming exhibition at Missoula Art Museum. This is Wendy Red Star’s first solo exhibition, and MAM is pleased to be hosting it. The museum hopes many folks will come to town for this; we hope that those who do will stay in our Missoula Bed and Breakfast. Wendy Red Star's exhibit at MAM runs August 5 - November 27, 2011. Wendy Red Star was born in Billings, Montana, and raised on the nearby Crow Reservation. She has lived in urban California and now resides in Portland, Oregon, but her art reflects her deep roots in the Crow Reservation of Montana. Her photographs depict everyday life on the reservation: cars, basketball hoops, sweat lodges and government houses. Missoula Art Museum is hosting an Artist’s Reception for Wendy Red Star on August 5, 2011, from 5 – 8 p.m. Red Star will talk about her work that evening at 7 p.m. This event coincides with Missoula’s First Friday Art Walk, when all of the art galleries and museums in Missoula stay open late. It’s generally a festive occasion. Whether you are traveling from eastern Montana or the East Coast of the U.S., you are sure to find Missoula a vibrant, interesting city. We enjoy nothing more than sharing our home town with guests of our Missoula Bed and Breakfast. Hope to see you soon. More information about Red Star’s exhibit is available at MAM.